I am really happy to announce that the highly anticipated new version of ZoomPanel library is finally released. Added ZoomPanelNavigator, NavigationCircle and NavigationSlider controls. They can be used to move around zoom area and set zoom factor with slider (shown in the upper left corner in the image above). Added ZoomPanelMiniMap, ViewboxExMiniMap and BaseMiniMap controls. The ZoomPanelMiniMap can be used to preview which part of the content is shown. It also enables moving the shown content and zooming in and out with mouse wheel (shown in the bottom right corner in the image above). 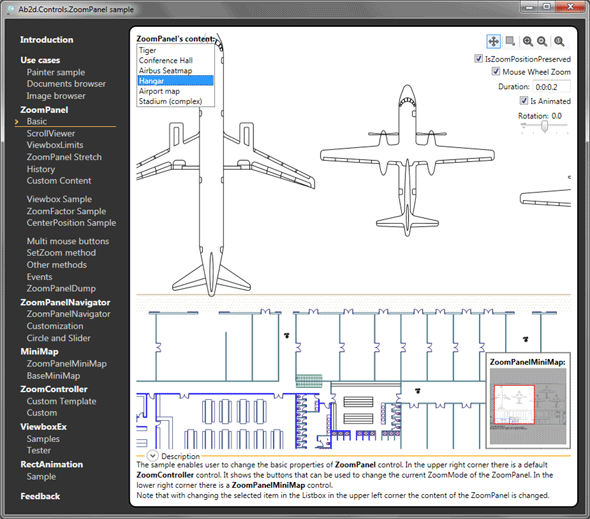 Added ZoomFactor, CenterPosition and CenterPositionUnits properties to ZoomPanel. Before the area that is shown with ZoomPanel was controller by Viewbox property. The usage of this property was sometimes quite complex. Therefore ZoomFactor and CenterPosition were added. They are much simpler to understand and use. Added IsAutoZoomPanelFindingEnabled property to ZoomController - now it is possible to disable automatically finding the ZoomPanel in case we need to set it manually. 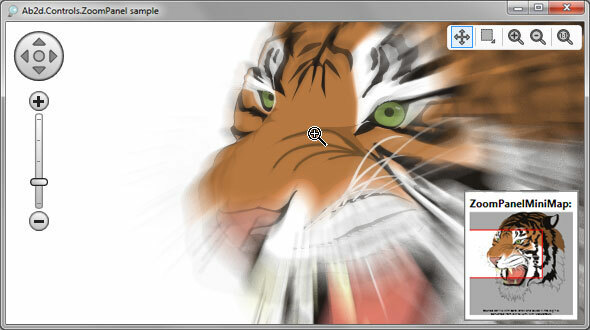 Even before version 3, the ZoomPanel was the most advanced zooming and panning control for WPF. With this release the control has become even better. The current price for the Single developer license is only $69. Because so many new features were added to the library, the price will increase significantly on 11th July 2011 (more details are available on Purchase page). So now it is an ideal time to purchase the control, renew the updates subscription or purchase source code for the library. 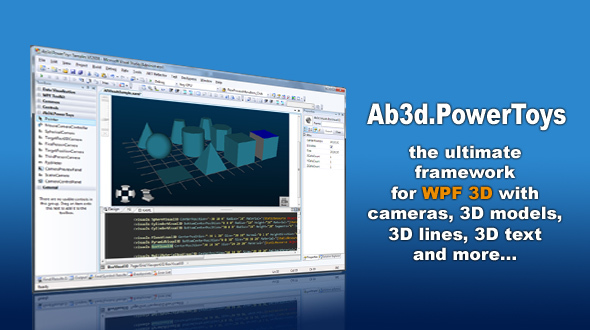 A new version of Ab3d.PowerToys was just published. The work on a new version was started as a response to the user post on the forum that asked how it would be possible to control a 3D camera from Ab3d.PowerToys library with his fingers on a multi-touch tablet pc. This looked as a simple an interested task but ended with discovering a probable bug in .Net 4.0 and creating a workaround for it. Also a discovered problems with WPF Browser applications were also fixed. 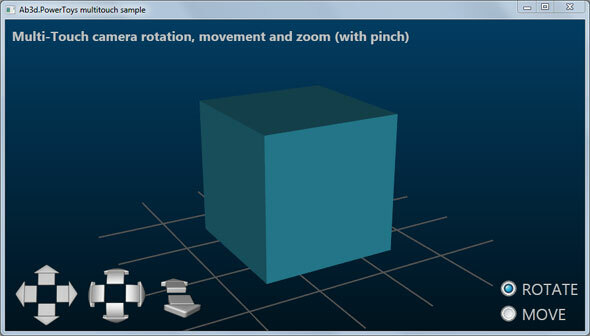 Added multi-touch camera controller sample (for .Net 4.0). Fixed using MaterialTypeConverter in .Net 4.0 applications (for example using the following in XAML: Materila="Blue"). Fixed problems in WPF Browser applications (fixed showing licensing windows in partially trusted environment). Added Ab3d.PowerToys WPF Browser applications sample. The following screenshot shows the working multi-touch camera sample. Because the support for multi-touch devices is available in .Net Framework 4.0 I did not want to put the new code into the library as it would raise the requirements from .Net 3.5 to .Net 4.0. So I have decided to create a sample .Net 4.0. project that would reference Ab3d.PowerToys library and use the multi-touch capabilities of the framework to adjust the camera. Cameras and camera controllers in Ab3d.PoweToys library are very extendable, so it was really easy to create a multi-touch camera controller. // Rotate and move with calling RotateCamera or MoveCamera methods on MouseCameraController1. // Both methods take mouse dx and dy as parameters. // The amount of rotation is controller by EventsSourceElementRotationChange property on MouseCameraController1: Gets or sets the double value that specifies for how many degrees the camera is rotates when the mouse moves from one side of the EventsSourceElement to another size. The default value is 270. As the code shows the pinch zooming is represented as Scale in the DeltaManipulation. The scale is simply used to adjust the camera's distance. Handling of the translation depends on the state of the RadioButtons that specify if we are rotating or moving the camera. In case of rotating, the RotateCamera method on camera controller is called. It takes the mouse difference as input parameter. In case a camera movement mode is selected, MoveCamera method is called - again it accepts mouse changes. The xaml was copied from other samples for Ab3d.PowerToys library. When the project with other samples was started, there was no runtime exception. But in the new multi-touch sample the same line suddenly produces an exception. This is very strange. I have removed the Material="#247589" and use the standard WPF was to set the material (as written above). This time the sample worked without errors. The difference between the working and not working project was the target framework version. The not working was using 4.0. It looked like that the baml parser (parser that reads the compiled xaml) in .Net 4.0 works does not want to use the custom type converter (MaterialTypeConverter). It was time to search the web. There were many problems with custom type converters, but none was similar to mine. The web did not have a clue about my problems. To make things easier, I created two new project were I wanted to reproduce the problem with as less code as possible. The first attemp showed that type converters on properties and dependancy properties work correctly in .Net 4.0. After some additional checking I have discovered that the Material property in Ab3d.PowerToys library was not created from stretch with Register method, but was created with AddOwner method - I wanted to reuse the already defined property on my own class. That was a breakthrough. When I changed the Register method with the AddOwner on a simplified project, the same error occurred. After that discovery the workaround was simple - define the Material property from stretch. This showed a case where assemblies that are created for .Net 3.5 does not work the same when they run with .Net 4.0. I think this should not happen. I am going to report this as a bug to Microsoft Connect. So a rather simple task lead to interesting discoveries. The multi-touch sample is available with the new version of Ab3d.PowerToys library. If you already have the library and do not want to upgrade to latest version just to see the sample, you can also download just the sample from the following link: Ab3d.PowerToys.Multitouch.zip (remember to uncomment the old style 3d box definition in xaml). From Ab3d.PowerToys version 5.2 on, the multi-touch support is already build into the core Ab3d.PowerToys library into its .Net 4.0 version. This means that you do not need to use special MultiTouchMouseCameraController class for that. All you need to do is to make sure that you are referencing the .Net 4 version of the library from the ".NET 4" subfolder (the .Net 3.5 version does not support multi-touch). This release brings many improvements to almost all our products. 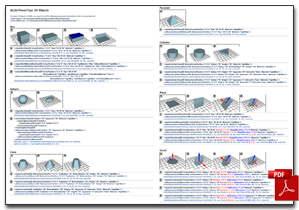 The metafile reader (Ab2d.ReaderWmf) library got most of the changes. The svg reader (Ab2d.ReaderSvg) also got a few new features. There were also some improvements that affected all the products except ZoomPanel. ZoomPanel control was left out of this release because the library is waiting for a major upgrade. Now when this release is out I will finally start working on it (many things are already prepared - like mini map, rotate the content, zoom slider, etc. - they just need to be polished and tested). The licensing dialogs are now created in WPF and not in Windows Forms as before (this skips loading Windows Forms and other related assemblies and therefore speeds up the application start - especially in evaluation version). Improved commercial license code that tries to find embedded resources - this code is now much faster. Added splash screens to all of the converter applications. Besides the changes above the Ab3d.Reader3ds and Ab3d.PowerToys libraries did not get any new features. But as mentioned before the Ab2d.ReaderWmf library was improved quite significantly. The code that transformed positions data from metafile into WPF was rewritten from ground up. The new version now enables to specify in which units the read positions will be - they can be in Pixels, Millimeters, Inches or GdiCompatable units. This can be useful when the drawing for example in Microsoft Visio is created in millimeters, the WPF elements that are created with pasting the drawing into Paste2Xaml can be also defined in millimeters. When the default Pixel units are used, the size of the read metafile is now the same as the size that is shown when the metafile is opened by Windows. Added MetafileUnits property. It specifies the units in which the metafile is read. By default its value is set to Pixel. It can be also set to Millimeter, Inch or GdiCompatable. This can be useful to preserve the positions and other properties when the drawing is created in millimeter or inch units. Added AutoSize property - defines if size of the root canvas is get from metafiles bounds or its frame. When bounds is used, the root canvas size is just as big as its containing objects. Added GetSize(units) method that can be used to get the size of the read metafile in the specified units. The size of the read metafile is now by default (if MetafileUnits is Pixel) the same as the size shown when metafile is opened by Window. Improved reading metafiles that use MM_LOMETRIC, MM_HIMETRIC, MM_LOENGLISH, MM_HIENGLISH or MM_TWIPS mapping mode. When reading polyline from a metafile and it has only 2 points a Line is used instead of a Polyline. Added UsedMinLineWidthFactor to get the used minimal line width. Improved Ab2d.Utility.ReaderWmf.ResourceDictionaryWriter - now the process of creating ResourceDictionary from metafiles can be better customized by creating a derived class. Removed obsolete Ab2d.WmfViewbox control - the control has been obsolete for a few versions - Ab2d.Controls.WmfViewbox should be used instead. This also removes the need for Designer assemblies to remove the obsolete control from Designer ToolBox. The Paste2Xaml application that can be used to simply copy objects from drawing application and paste them into XAML was also improved - support for the new features of the Ab2d.ReaderWmd library was added. Markers (arrows and other line endings) are now correctly show on line and polyline elements (before they worked only on path elements). markerWidth and markerHeight attributes are now correctly handled. Removed obsolete Ab2d.SvgViewbox control - the control has been obsolete for a few versions - Ab2d.Controls.SvgViewbox should be used instead. This also removes the need for Designer assemblies to remove the obsolete control from Designer ToolBox. Now I have to put together the new version of ZoomPanel. Than a new exciting area awaits - Silverlght 5 with its 3D. A minor update for Ab2d.Reader3ds and Ab3d.PowerToys libraries is available. The update fixes licensing code for WPF Browser applications (partially trusted) - before it was not possible to use both Ab3d.Reader3ds and Ab3d.PowerToys the same WPF Browser application. The update also fixes problems with reading some tga files with Ab3d.Reader3ds. Because some older 3ds files use tga files for textures quite often, the internal tga file reader was added to version 7.0. This version had problems with some tga files. This problems are now fixed. Some of you have already noticed that the evaluation version has a brand new installer that enables installing any product from only one installer (before each product has to be installed separately). With the new versions the new installers are now available also for commercial products. Because of the new installers there are also new commercial versions of Ab2d.ReaderSvg and Ab2d.ReaderWmf libraries available to commercial users. Those versions contain just small changes made for the new installation process and do not bring any new functionality. The Ab2d.ReaderWmf library has recieved a minor updated. Fixed reading some embedded images (before sometimes FileFormatException was thrown). Improved positioning text and handling rotated texts. Fixed reading arc and pie segments for some cases. Added ImageFileExtention string to EmbeddedImageData. Improved setting minimal line thickness. In metafile a line thickness can be specified to 1 pixel regardless of the zoom level - this is not possible in WPF and Silverlight. The algorithm that sets the line thickness has been improved to prevent getting too thick lines.